weeks ago, i got an email from a reader telling me how good my skin looks...and asked me what products i've been using. of course, i did tell her that it's just makeup...and it's true! my skin is FAAAAR from being great. but i must admit, it has gotten better ever since i went back to OBAGI last January. 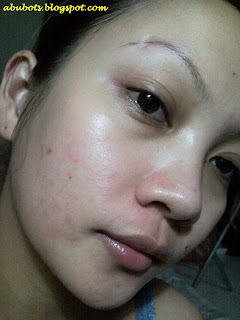 If my derma's reading this post, she'd surely agree if i say that i am so mean with my skin. i am so lazy to pay her a visit to have regular facials, diamond peels, etc. and i am SO fond of pricking! i'll only drop by her clinic when my skin is really terrible and my face already looks like it has grown out from a bunch of pimples. i also tend to change my skin regimen out of a whim. each time i'd see new products, curiosity would kill me and i'll end up trying them. then, my face will react...and so i'll try another set of new products...and the cycle goes on. I remember my last visit with her last December (yeah, it's been that looonnng!) when i got tons of sermon because my skin was acting up again. bumps here...pimples here...so baaadd! then she advised me (for the nth time) to stick to the regimen that worked for me and stop experimenting...and to my surprise, the stubborn me finally decided to listen. 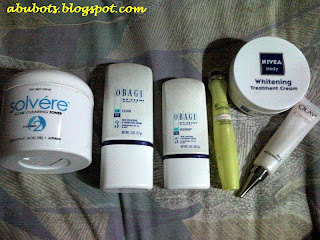 She told me to get back to OBAGI and added a few more items on my skin care regimen. And i've been using them ever since...and i am glad that it works! 1. Use orange soap (not in the picture) to wash my face. I got this soap from her and i can say it's really good! It doesn't sting and doesn't dry up my skin. 2. Pat a damp cotton with the L'oreal White Perfect toner on my face and neck. This she didn't recommend...but i'm such a sucker for whitening products that i decided to try this one...and i love it! 3. Apply Garnier eye roll-on on my eye area. Again, not suggested by her but i love the depuffing effect. I then pat Olay Regenerist eye serum on top. 4. 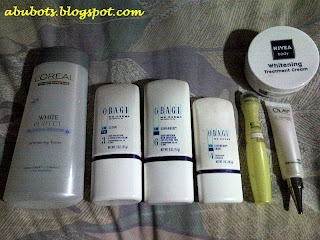 Apply Obagi Clear all over my face...i apply more on those really dark spots. 5. Apply Obagi Exfoderm Forte. This product from Obagi is what i love the most. It really helped me get rid of those stubborn bumps i got from pricking. 6. Apply Obagi Sunfader which is not only a sunblock but also helps in whitening dark spots. yep, too much products on my face during the day...and all of them being cream-based (Obagi), i am surely to look like an oil mine by midday so i always make sure that i carry oil-blotting papers with me. 2. Wipe Solvere toner pads all over my face. 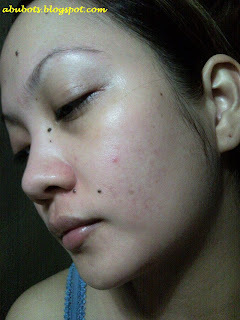 I've always been allergic to benzoyl and my derma told me that Salicylic also helps to get rid of bumps and pimples. I am loving this product and making sure that i have lots of stock! For my neck, i still use the L'oreal toner. 5. Obagi Blender mixed with tretinoin. 6. Nivea whitening cream on my neck and decolletage. see...now you know how scary i look without any makeup on! so there's my skin care regimen...i hope i didn't scare you to death though! I wanted to ask: Does the Garnier eye roll really work?? You’re face is not scary at all. By the way, thanks for sharing your skincare regime!